The DS1515+ arrived the other day. Very nicely packaged – the ReadyNAS 312 had a stable box too, but the Synology one is something extra. Small box at the top, with two ethernet cables, power cable and various screws & tools. After popping in three 5 TB WD Red drives, connecting power and a network cable it’s time to get started with the software. According to the manual the NAS should announce itself and it would be possible to use a browser based setup. Didn’t work at all though. 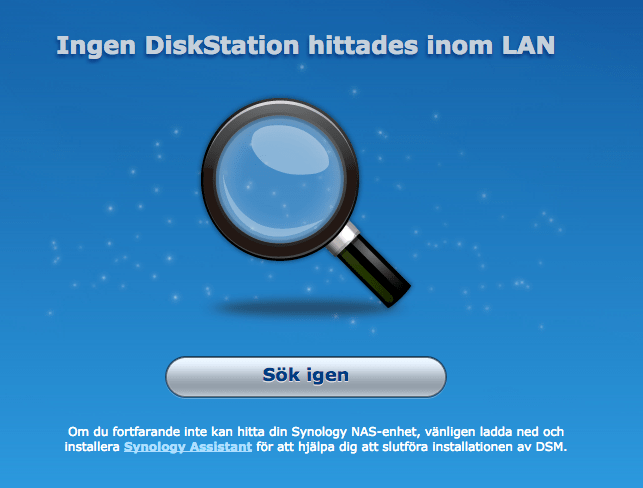 Also, why does Synology insist of offering this page in Swedish? Ok, that’s where I live, but I really want to do these things in English, and there is no option to select another language here. Annoying. Had better luck with the OS X app though, it immediately found the NAS and started the installation process. Once that’s done and after logging in, we are greeted with a surprisingly good UI. It feels nice and snappy, even has a rudimentary – but working – window system. A set of widgets can also be opened and used to monitor various aspects of the NAS (disk utilisation, warnings and alerts, recent log messages etc). The verdict after the first half hour is: Very nice! That silly initial language setting is quickly forgotten once we switch to English. Setup done, ready for first login. Nice user interface! Finally – language can be changed!